The Fund has a dedicated corpus of CHF 3 million, which will be disbursed over the next three years. In its first call for proposals, the presidency received an overwhelming 50 submissions. Out of them, nine have been selected to receive funding for their open science projects, including two laboratories of the School of Computer and Communication Sciences (IC). The Integrated Systems Laboratory (LSI), headed by Professor Giovanni de Micheli, was awarded funding for its open science project, “Promoting Open Benchmarks in Logic Synthesis.” The Open Logic Synthesis Libraries and Benchmarks are a collection of modular open source C++ libraries and benchmarks developed at LSI to improve optimization algorithms in the field of logic synthesis. The project aims to promote the research community’s adoption of benchmarking tools and open software libraries for reproducing and comparing performance between different technologies. The contact person for the project is Heinz Riener, a post-doc at LSI. 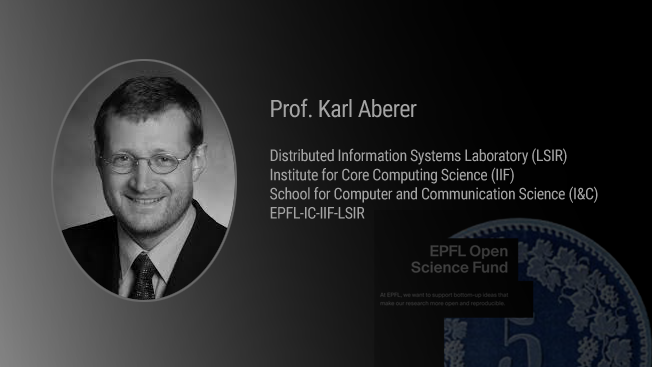 On the other hand, the winning proposal by the Distributed Information Systems Laboratory (LSIR) was for the project, “Evaluating the Quality of Science News Articles.” The laboratory, led by Professor Karl Aberer, will use the Open Science Fund to develop a platform called SciLens to verify the credibility of journalistic articles and social media content on scientific findings. SciLens automatically generates indicators to combat fake news by identifying news items that misrepresent the results of scientific studies. The Open Science Fund initiative has been accompanied with other related steps to help widen the reach of research and make it more open. These include a dedicated web page providing information, news, and happenings related to open science at EPFL, and the organization of an Open Science Day on October 18 this year to mark EPFL’s 50th anniversary.